The Velocity 400 is based loosely on the Beta 450 - a simple four 'pole' tunnel tent with 4-berth sleeping compartment plus a more than handy living/storage space. AirBeam tents are easy to pitch - simply peg out each corner of the tent in place and then inflate the AirBeam inflatable inner tubes with a double action hand pump or Vango AirBeam pump and the tent effectively pitches itself. Then simply peg out the guys (bit harsh innit?) and you are ready to go. Everything is pre-attached, the AirBeam tubes, groundsheet and flysheet and so there's no preparation or assembly required. 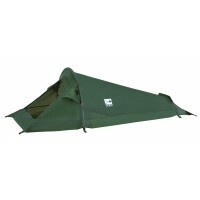 The flysheet is a high quality, embossed polyester with 6000mm hydrostatic head waterproof protection. 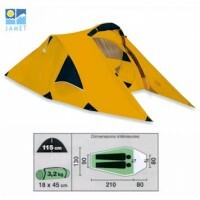 It features a fully sewn-in polyester groundsheet in the porch area and a breathable fabric inner tent which also has its own polyester groundsheet and easy find inner clips. 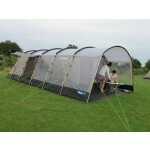 The inner tent also features a part mesh inner door and a detachable inner divider so you can split the inner into two. Other features include two side doors with inner mesh doors, 'Crystal Clear' windows with inner covers, mesh vents, flysheet first pitching, and handled carry bag. Flame retardant materials throughout. 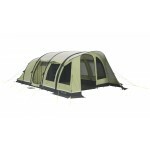 Vango Velocity 400 Airbeam Tunnel Tent.